Tyristand ; have also searched Norderhov and Hole. Johanna and Nils Engebretsen were the parents of Nicolai Nilsen Tanberg, born July 23, 1876 in Tyristand, Hole. The obituary for Nicolai states his father died before he was two years old and that Nicolai with his mother emigrated to Rothsay, MN in 1878. Andreas (Andrew) was definitely included in the family of Johanna and her husband, Christian, whom she married in Wilkin County MN. in the early US census. I have begun to wonder if Johanna adopted Andreas because of the span in the two births . I have searched the church emigration lists with no luck (Andreas or Johanna and Nicolai) and tried to search the Oslo emigration lists. Would the Ringerike Historical Society (Tom Larson) have any clues? 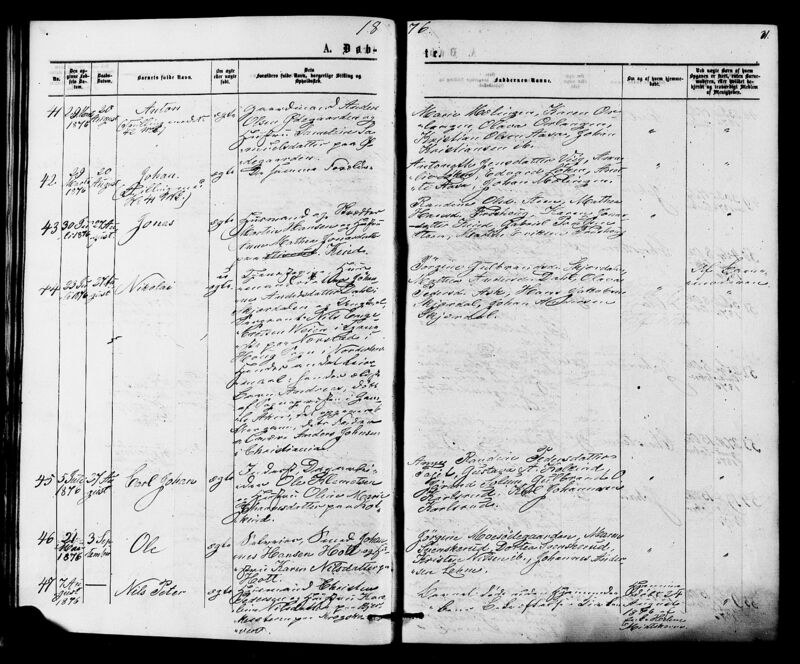 In Ringerike slektshistorielags database I have found this when Nikolai was babt in 1876. (ser ut som Thronsen i kirkeboka, se neste innlegg) i Christiania. Edited December 2, 2014 by Tom Larsen. Gamle Aker kirke 1864-1872. side 211 nr, 132. Kildeinformasjon: Oslo fylke, Gamle Aker, Ministerialbok nr. 2 (1864-1872), Fødte og døpte 1870, side 211. Thanks so much. I'm having trouble reading the 'Remarks' beginning with (hendes andet Leiemaal' then det opgives 6 aar?? ). Johanna must have gone to Christiania to find work ? 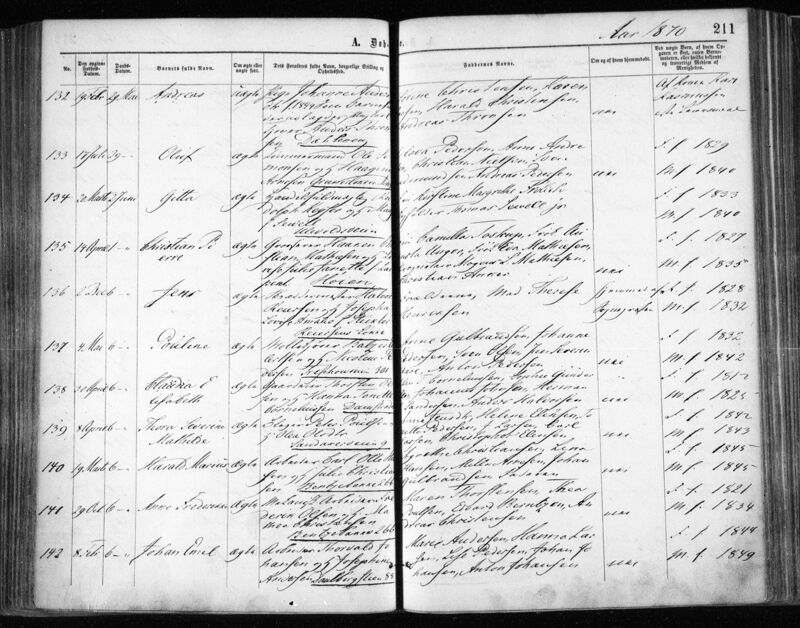 Andreas born 1870 February 19th, baptized May 29th, Out of wedlock, Parents (pige) Johanne Andersdtr f. 1844. As the child's father the bachelor, servant Anders Thronsen is pointed out. Godparents: Sørine Christensen, Karen Larsen, Harald Christensen, Andreas Thronsen. The information about the birth was given by the married woman Kari Rasmussen. 1st 'Leiermaal'. jeg har vært uten nettforbindelse i dag, har nettopp fått den tilbake. Was there confusion as to the last name of the father? The record of the baptism is the primary source to the name of Andreas' father, so the vicar in Gamle Aker most likely wrote his patronym incorrect in the papers Johanne brought with her to Hole parish. He came from Norderhov as well. jeg leste det som Thronsen. Når det gjelder emigrant protokollene fra Oslo er det flere som ikke er med i databasen på digitalarkivet. så det kan være grunn til at du ikke finner Johanne, Nikolai der. legger ved link til Hole kirkebok 1876 og det er lett å se at de har tolket det til Johnsen. Kildeinformasjon: Buskerud fylke, Hole, Ministerialbok nr. I 7 (1873-1877), Fødte og døpte 1876, side 31. Edited December 3, 2014 by Tom Larsen. only taught us to count to 10! I read it as Thronsen. Regarding emigrant protocols from Oslo there are several that are not included in the database of digital archives. so there may be reason why you can not find Johanne, Nikolai there. attach link to Hole parish in 1876 and it is easy to see that they have interpreted it to Johnsen.